Automatically get paid whatever earns you the most money! Our new Upside Pay program is for ATS Flatbed Specialized and Van Pad Wrap Company Drivers. As an ATS Flatbed Specialized and Van Pad Wrap Company Driver, you earn CPM or a percentage of Transportation Revenue — whatever pays you the most. The best part is you don't have to choose! You will automatically get paid whatever earns you the most money on each and every load. 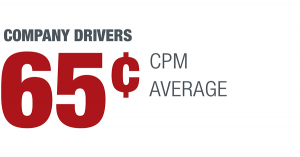 During our program testing, Company Drivers earned an average of 65 CPM! With Upside Pay, there's no downside. NEW! Upside Pay program: 23 percentage or CPM - whatever earns you more! Average 65¢ CPM!